The first rains have begun, jerking me out of my bed in the wee hours of a Saturday morning. Windows are hurriedly shut while thunder pounds the skies with no desire to let up. This is Nigeria. And the rains are almost always knocking at the door. I’m not opposed for the rains bring goodness, by the basketful. Market stands teem with fresh, juicy fruit – everything from mangoes to oranges, soursop and more. Last week, I ate my first four mangoes. Back to back. No sitting around in idle worship. None of that. Just full, flavourful adoration. But this isn’t mango season alone. 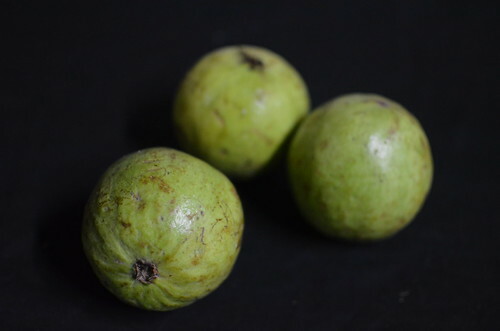 This is also the season of many green fruit – Guavas included. Thick walled, blossomy and full of small, hard seeds. They resemble garden eggs except they are crunchier and not as spongy. I like mine ‘just-ripe’, so the thick seedless region that borders on the green skin and cloaks the beige-yellow seeds is soft, and sweet. I swallow the seeds as I chew the centre for they are too hard to crunch. I love them. Its also the season of pepperfruit, a pungent, spicy ‘fruit’, with a deliciously sweet taste and refreshing fragrance. 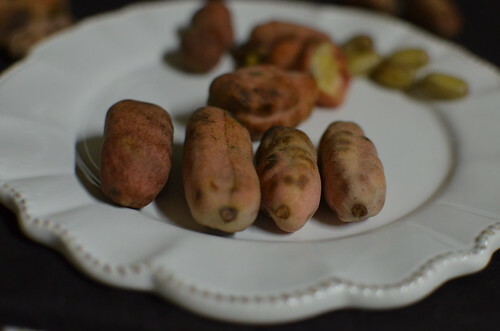 Its botanical name is Dennettia tripetala, of the plant family Annonaceae. It is early in the season for the first fruits but they’re there – visible on market trays and street corners. And a companion to Garden Eggs when company, they seek. Its Nigerian names vary from east to west. The Igbos from the east call it Mmimi while the Yorubas from the west refer to it as Ata Igberi. The Edos from the south know it as Ako; the Urhobos call it Imako and the Ibibios & Efiks of the south east call it Nkaika. The fruit is thin-walled and varies from sweet and dry, to slightly thicker, moist and juicy fruit. I love ripping the flesh off the fruit and sucking the seeds clean of light pulp before spitting the ‘hot’ and peppery seeds out. But there are people who eat the who fruit straight up, biting skin and seed and chewing again. Pepper fruit are sold green (unripe), and red (ripe). The green variety are crisp and crunchy, in total contrast with the ripe fruit which change colour to red and become sweet, with softer, juicier flesh. I am a huge fan of the red! The flavour of the whole fruit is complex, hard to describe. It’s not quite citrus, somewhat blossomy…as peaches, and fruity in a savoury, tomatoey way. Bite into the fruit and you’ll get mint and menthol as in grains of paradise, a bit of heat as in fresh green chilies and that familiar citrusness that’s inherent in kumquats. The overall flavour and fragrance is fresh. Tropical. Alive. Unlike my friend, N who loves the fresh, green ones. She says in her hometown, you’ll find these fruits all year round. While they’re in season, her ‘people’ preserve them by drying so when the season’s over they have a steady supply. I’ve read report of the fruit being used as a spice for meat and sausages, but I haven’t tried it myself. I’ve am ready to try cooking with them but I’ve always known and loved them as ‘snacks’. I’m going to try to preserve some, and see what happens in a few months. 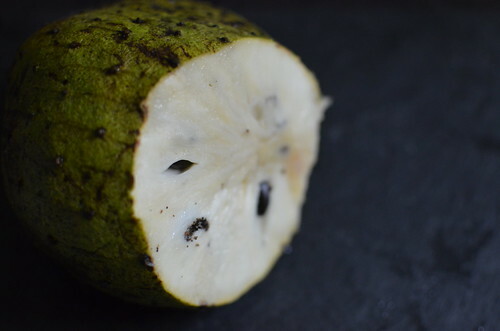 Soursop. 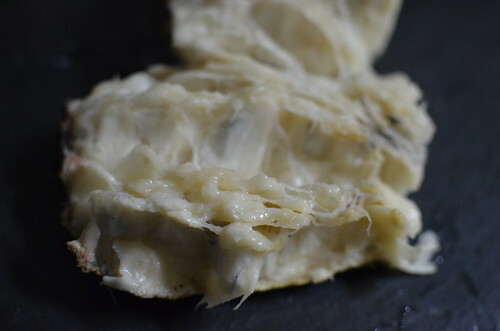 With skin green and somewhat thorny, the Soursop resembles Durian, which I have heard about and never tasted – just without the offensive smell. The season of more green. Taste profile: Creamy and sweet with hints of citrus (lemony even) tartness. Some compare the sweetness to that of strawberries and pineapple, and the creaminess to bananas. 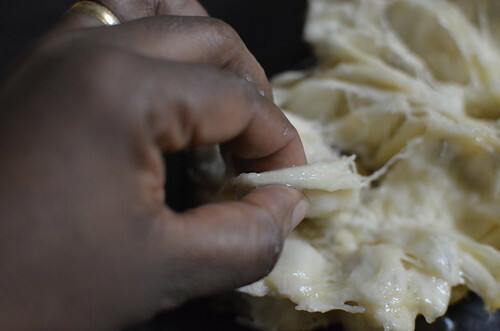 To eat: You wash the skin, just as you would pawpaw or pineapple, and cut into it. 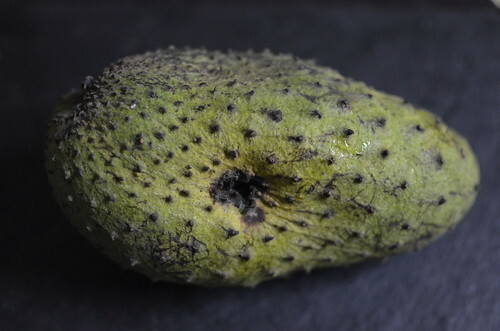 Beware: according to Wikipedia, Soursop seeds are toxic – containing a compound, annonancin, just like Cherimoya seeds. To eat, you slice it any which ways…. I prefer length ways, which follows its natural lines. Then you pull bits of pulp…. 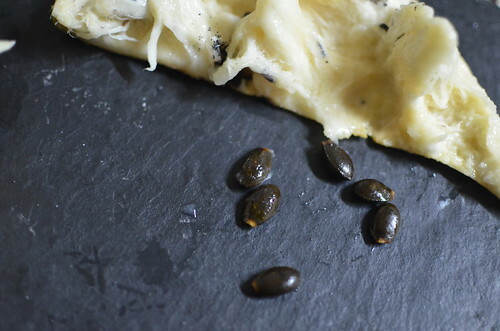 ….which come off in ‘tufts’ and eat them…. ….avoiding spitting out the seeds. 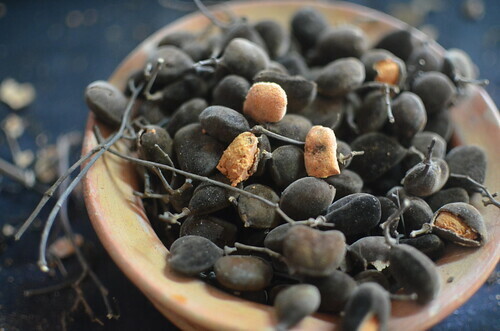 It is also the season of Icheku, Velvet Tamarind. Cousin to sweet tamarind, very popular in Asia. 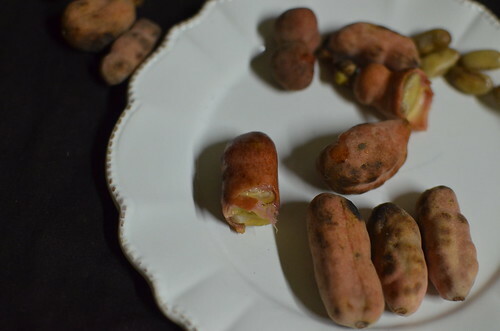 Size: The fruits are small, about a centimetre in diameter, with fruit slightly smaller and even smaller seeds, up to 8 millimetres in diameter. 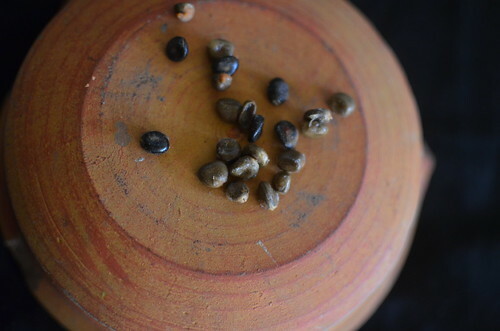 Some pods have one seed and others, two. Taste profile: Sweet and Sour. 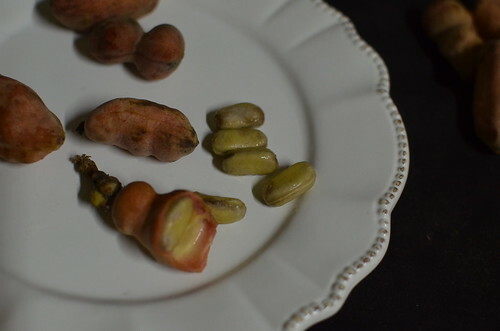 It tastes similar to sweet tamarind, but the seeds aren’t as meaty, pulpy. 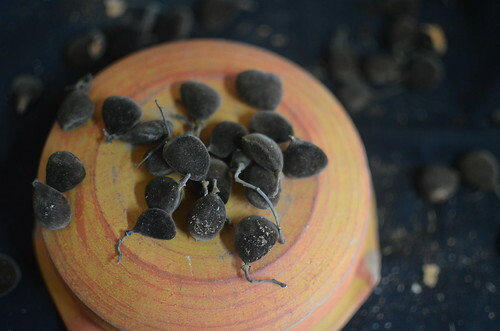 To eat: you crack the soft black, velvet shells to extract a small orange fruit. 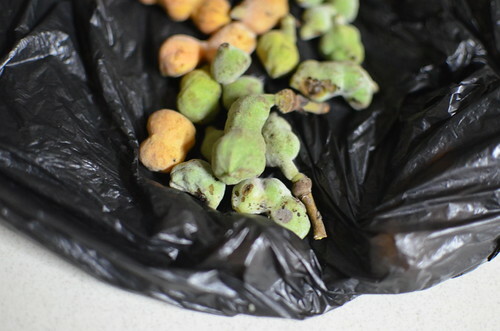 The fruit has a powdery texture and tangy flavour and is sucked on till all that remains is the glossy brown seed at the core. 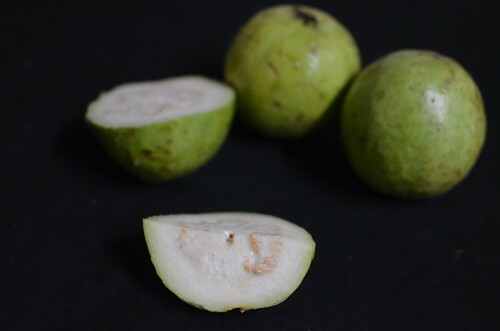 The first guavas can be seen in groups two, sold in bowls and pyramids of threes and fours, the size of small pears. I haven’t performed any wonders with these yet though I hear you can make ice-cream and fruit punches of Soursop; and even a drink from velvet tamarind. For sometimes a season’s best is best eaten or licked…out of hand. But wait, a Mango Srikhand is on my mind….As well as preserving the pepper fruits. In the interim, I’ll continue to eat away. Are you familiar with any or all of these ingredients? If you had to use them, what would you do?